Gales of up to 70mph are expected to hit the morning rush hour and more blustery weather is forecast into the weekend. The Met Office has put a warning for wind in place, advising the public there could be travel delays and possible short term power losses. Overnight winds reached 79mph on the Isle of Wight, and 67mph on the Isles of Scilly off the coast of Cornwall. 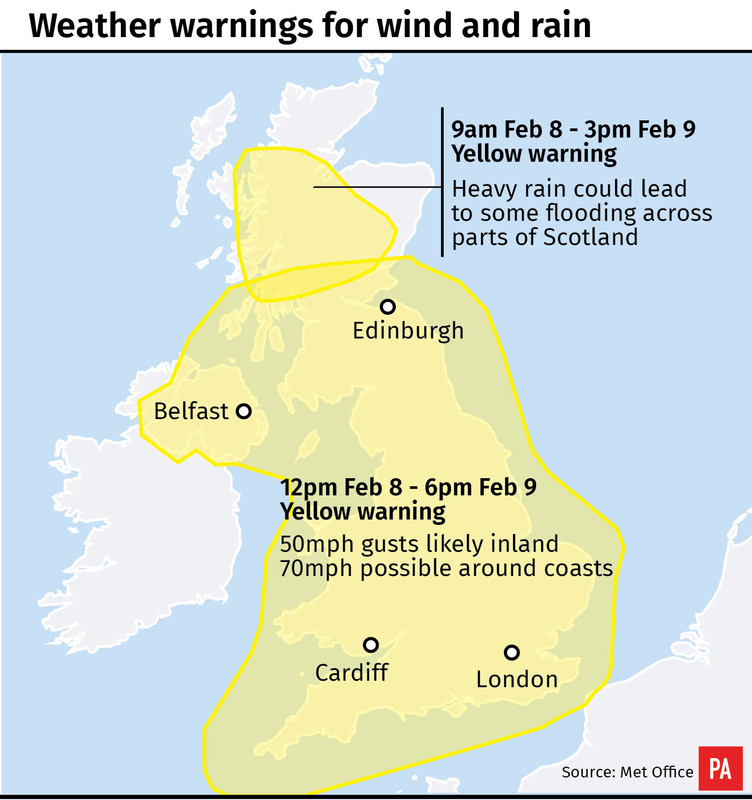 The warning covers Wales and southern and central parts of England. Meteorologist Mark Wilson advised motorists to take care. While winds will ease off into breezy weather mid-morning, leaving sunshine and showers, gusts are due to pick up again by midday on Friday, with a warning from then covering most of the UK and remaining in place until Saturday evening. This will be accompanied by a warning for persistent heavy rain in Scotland, where as much as 60mm is forecast to fall over high ground. Temperatures will stay mild on Thursday, with highs of 7C (45F) in Scotland and 10C (50F) in the south of England, Mr Wilson added.